Model 500 Heavy-Duty Fume Extractor - Sentry Air Systems, Inc. The Model 500 Fume Extractor is engineered for applications that require heavy-duty fume extraction and industrial air purification. 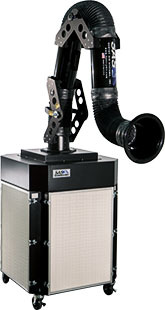 The Model 500 Micro-Pleat Fume Extractor is equipped with cleanable Micro-Pleat Series 1 Particulate Filters and is designed for applications such as production welding (MIG, TIG, Stick, Plasma Cutting), some dust collection applications, powder weighing, grinding, and multiple operator fume extraction (classroom settings, multiple soldering, welding, and brazing stations). This unit is capable of providing up to 1300 CFM of air volume and is available in various source-capture configurations. Reverse pulse solutions, particularly in heavy-duty welding applications, wet smoke, wet particulate, and humid environments, are criticized for their inability to clean their filters. Moderate and long-term filter maintenance necessitate constant pulsing or even frequent filter replacements. After carefully choosing our proprietary MERV 16 filtration media, we spent months welding under the harshest of environments with sticky flux core wire and Houston humidity in an uncontrolled/non-conditioned shop workplace. After 2000 lbs of sticky, wet, flux wire in 80%+ humidity, the unit and its filters were still going strong after only 3 filter cleanings – that is less than 30 minutes of filter maintenance in 4 months of full-time welding. The Particulate Filters in the Model 500 system are engineered to be easily cleaned with the use of pressurized air. This form of self-contained cleaning does not require removal of the filters; the operator simply sprays air into the filter media to clean and rejuvenate the filters while excess dust and waste falls to the internal dust pan, allowing for simple and clean debris removal. The included magnehelic gage is an excellent tool for determining filter saturation. Once the pressure levels begin to increase, the operator can clean the filters and the pressure reduction will be noted on the gage. The Model 500 is also available with 240 lbs. of Activated Carbon Filtration and is designed for applications including chemical fume control, epoxy and solvent fume removal, multiple operator fume extraction, and processes involving VOCs. This model is capable of providing up to 1100 CFM of air volume. 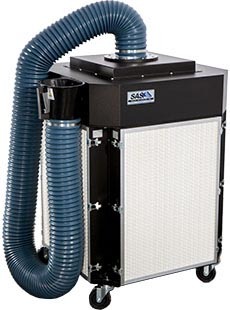 The extensive amount of activated carbon filtration makes this portable unit very unique and allows for operators to have access to a large amount of filtration in confined or isolated areas where external venting is not possible. Specialty-blended filtration media may also be utilized with this unit and includes Acid Gas, Mercury, Aldehyde, and Ammonia filters. This system also comes equipped with refillable filter frames for easy filter replacement and low cost maintenance. In addition, a Variable Speed Controller is a standard feature. Both Model 500s are portable and require no exterior-ducting or makeup air. Heavy-duty locking casters and a variety of extraction arm options make these fume extractors the perfect solution for applications that require a powerful respiratory engineering control with maneuverability. One popular arm option is a 12’ L by 6” diameter flame-retardant, flexible “python” hose, which is available in singular, dual, and quad options to accommodate one or more operators. For more information on the Model 500, please call us at 1.800.799.4609, email us at sales@sentryair.com, or fill out this form to receive more information.